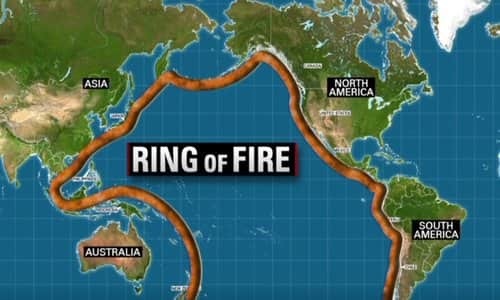 The portion of "the Ring of Fire" that runs along the west coast of North America is starting to shake like a leaf. As most of you already know, the outer perimeter of the Pacific Ocean is known for high levels of seismic activity, and the experts tell us that more than 80 percent of all earthquakes and more than 70 percent of all volcanic eruptions take place within the Ring of Fire. The North American section of the Ring of Fire has been relatively quiet for an extended period of time, but now all of the shaking down in Mexico is causing a tremendous amount of concern. In fact, some now fear that all of the shaking down there may be a harbinger of things to come for California. South of Mexico City, the Popocatepetl volcano sent a column of ash into the sky, capping a period of seismic activity including two powerful tremors this month that have killed more than 400 people and caused damages of up to $8 billion. Mexico's capital was shattered by Tuesday's magnitude 7.1 quake that flattened dozens of buildings and killed at least 307 people. The earthquakes are getting most of the attention from the media, and without a doubt they have caused extensive damage, but Mt. Popocatepetl may be of even greater concern. It has "registered 181 low-intensity exhalations" in recent days, and on Saturday it erupted explosively three times. A catastrophic eruption of Mt. Popocatepetl would be a nightmare beyond anything that we have witnessed in the modern history of Mexico. The volcano sits only about 50 miles away from Mexico City, and there are close to 25 million people living in the Mexico City metropolitan area. In recent years, smoke and ash from minor eruptions of Mt. Popocatepetl have reached the city, but most people living there have absolutely no idea how immensely powerful the volcano truly is. But we haven't witnessed anything like that in any of our lifetimes, so it is hard to even imagine devastation of that magnitude. In addition to Mexico City's mammoth population, there are millions of others that live in the surrounding region. Overall, there are about 25 million people that live in the immediate vicinity of Popocatepetl. Thankfully, we haven't seen a major eruption of the volcano in modern times, but at some point that will change. As seismic activity rattles Mexico, many living on the California coast are beginning to take notice. Last week residents of San Jose were reportedly stocking up on emergency supplies over fears the area will be hit by a massive earthquake. The city was shaken by a number of tremors including a strong 3.3 magnitude quake that was felt throughout the region. San Jose is situated precariously close to the San Andreas fault line, an 800-mile fissure that runs almost the length of California. Scientists agree that large swathes of southern California - including Los Angeles and San Diego - are long overdue a "Big One" earthquake of magnitude 7 or more. A preliminary-magnitude 5.7 earthquake struck off the coast of Northern California on Friday afternoon, but there was no threat of a tsunami, officials said. The quake's epicenter was 133.6 miles west-southwest of Eureka, according to the U.S. Geological Survey. Its depth was measured at 3.6 miles. A giant tsunami created by the quake would wash away coastal towns, destroy U.S. 101 and cause $70 billion in damage over a large swath of the Pacific coast. More than 100 bridges would be lost, power lines toppled and coastal towns isolated. Residents would have as few as 15 minutes notice to flee to higher ground, and as many as 10,000 would perish. And don't forget about the volcanoes on the west coast either. Mt. Rainier is known as "the most dangerous mountain in America" for a reason, and in my apocalyptic novel entitled The Beginning Of The End I show why this is the case. Someday Mt. Rainier will erupt again, and you don't want to be around what that happens. 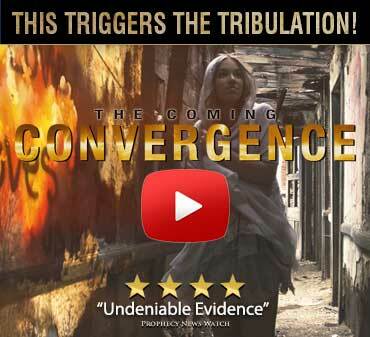 As recent weeks have clearly demonstrated, our planet is become increasingly unstable.